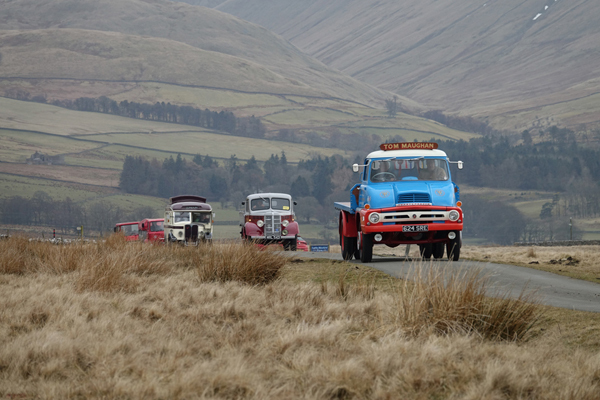 The Cumbria Easter Rally, the UK’s biggest, free rally of classic commercial vehicles turns 21 on Easter weekend, Saturday 20th and Sunday 21st April 2019, when the quintessential event returns to Kirkby Stephen and Brough, including the annual Saturday evening fell run between the two towns. The rally features over 250 vintage buses, lorries and commercial vehicles on show in Kirkby Stephen and Brough during the day, along with food & drink stalls, a children’s roundabout and a Fun Bus. There will also be free vintage bus rides between the towns. The event features painstakingly restored vintage lorries, buses, coaches, Land Rovers, military and utility vehicles, tractors and other farming vehicles, vans, wagons, steam engines and historic pedal bikes, that evoke the nostalgia of their era together with many a childhood memory. The fabulous classic vehicles taking part in this year’s Rally date back as far as 1919 and all have great stories to tell. They include several wagons from the famous William Hunter Collection, the 1984 minibus used in the film, Pride, about the Welsh miners' strike, buses used across the UK and the Isle of Man and old tractors that have been part of our farming history. In between viewing the amazing historic vehicles, the stalls welcoming shoppers include those selling autojumble, vehicle parts and tools, outdoor clothing and shoes, diecast models, local preserves, fudge, flapjacks and cakes as well as exhibition and promotional stalls including The Anniversary Exhibition of Ribble Valley Preservation Trust, The Teesside 500 Group, the Barrow Transport Museum Trust, a new Scammel Display. New this year is Pro Canvas Studio – your images of the beautiful vehicles turned into canvas for you to take home. For that breakfast lunch and tea break enjoy BBQ burgers, steaks and sausages as well as the popular Indian street food stall. A highlight of the 21st Cumbria Easter Rally will be the amazing annual road run through the fells, which takes place on Saturday 20th April. The evening procession of classic trucks and buses will delight the crowds lining the route with the fells of the Westmorland Dales creating a spectacularly beautiful backdrop for sightseers, professional photographers and Instagrammers alike. Encounter Eden, a not-for-profit, social enterprise designed to give the area an economic boost with a series of events in the region took over the co-ordination of the classic commercial vehicle rally last year. The Rally was previously organised by the Eden Classic Vehicle Group and the now-retired Hamer Family (returning as exhibitors with Cumbria Classic Coaches). The Auction Mart in Kirkby Stephen – classic vehicles. Market Square, Market Street and the Church Yard Kirkby Stephen – classic vehicles displayed and craft/artisan and food stalls as well as stalls for motor enthusiasts. The Kirkby Stephen Co-op car park – exhibitor displays as well as The Fun Bus and the Ribble Valley Preservation Trust anniversary display on Sunday only. The free classic bus service from Kirkby Stephen Railway Station to Brough – buses run in approximately 15-minute intervals. First bus 10:00. Last bus 16:30. Road Run on Saturday 20th April at 16:30 starting at Grand Prix in Brough. If you want to take a bus to join the route please be at the Grand Prix at 16:10.